Christmas Musical Santa Hot Air Balloon. Size: 15 inches. 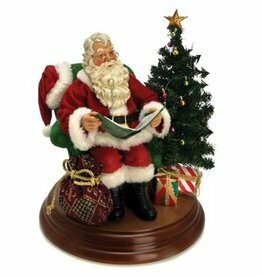 Christmas Santa Themed Table Top Figurines, Christmas Decorations and Holiday Decor creations by Fabriche Santas KSA Collectibles Collection Kurt S Adler. Size: 11 inches. Fabriche Santa Beach Santa playing Guitar with Parrot. Beach Santa Themed Table Top Figurines, Christmas Decorations and Holiday Decor creations by Kurt S. Adler. Fabriche Santas KSA Collectibles Collection.